Children crying, women wailing, men choking on their tears. This was not a scene from an action movie in Hollywood, this was Monday night on October 30 in the eastern Libyan city of Derna, where airstrikes hit a residential area in Al-Fatayeh killing 20 and injuring over 23, mostly women and children. The scene of ambulances rushing the injured to hospitals and the bodies to the morgue were followed the next morning by the funeral scene at the city’s Sahaba Mosque, where almost every person in the city was present to witness the burial of those martyred in the bombing. The bombing has raised eyebrows and several parties have found their backs up against the wall. No one has announced responsibility, yet everyone is wondering who could have possibly carried this out? The obvious initial reaction, was Operation Dignity warplanes led by Khalifa Haftar, whose media mouthpiece Al-Hadat TV Channel, rushed to claim responsibility for the bombing by saying it was the air force’s act against what they described as “terrorist gatherings.” This made sense as Operation Dignity forces have had Derna under siege and attack for months. But they later denied links to the attack and blamed on the “terrorists” inside Derna! The spokesman of Operation Dignity, Ahmed Al-Mismari, appeared shortly after in a video statement on Wednesday and denied any official connection by their air force with the bombardment of Derna city’s Al-Fatayeh district, calling for an investigation into the incident. After condemnations by many local and international figures and entities, Haftar’s leaderships and media outlets changed their tone. 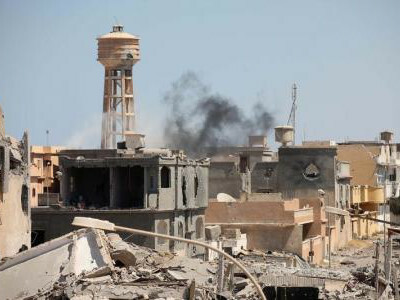 France, the United Kingdom, the United States, and Italy issued a joint statement on Wednesday condemning the air attack on Derna and the killing of civilians, urging law enforcement to bring the perpetrators to justice for this criminal act and for the ones before it, especially the massacre of 36 persons in Al-Abyar, eastern Benghazi. This reaction threatened Operation Dignity leadership, but on top of the initial reaction the United Nation Special Mission in Libya (UNSMIL)also called for investigation into the incident and for trying the perpetrators. The Presidential Council had issued a statement condemning the attack and urging the United Nations Security Council to probe this “heinous” crime. Moreover, the Senior Libya Researcher at the Middle East and North Africa Division of Human Rights Watch, Hanan Salah said the bombs that were dropped on Derna on Monday did not “just fall from the sky,” adding that they were fired by some party. She tweeted on Tuesday that the airstrikes targeted civilians including women and children, demanding an investigation into the issue. The outrage continued and so did eastern media outlets that began to run fabricated stories that funerals of the Derna victims being fake! After Haftar backed off on this one, Egypt did the same and its Foreign Ministry offered condolences to the families of the victims and condemned the attack. However, the Security Chief of Derna city, Yehya Osta Omar confirmed to local media on Wednesday that the airstrikes on Derna were carried out by F16 warplanes, which are owned by Egypt and UAE. He also identified that in aftermath of the attack, authorities observed damages to infrastructure and remains of B500 bombs that are both consistent with F16 bombers. Beside local resentment for the killing of civilians and the destruction of their houses and properties, Haftar and his senior leadership are now under the international community’s spotlight. He is accused of leading criminals some of whom are wanted by the International Criminal Court (ICC). These recent events are further examples of war crimes committed under his watch and in his jurisdiction, no different than Ganfouda and the Al-Werfalli ICC arrest warrant. The joint statement of the four countries on Wednesday made it very clear that not only are the perpetrators accountable but also are the personnel giving orders – all shall be taken to court for their criminal actions. Will the ICC manage to bring Haftar, who is Mahmoud Al-Werfalli superior, to the Hague and try him for hundreds of crimes, destruction of cities and displacement of a population; or will the international community remain a mouthpiece for fancy-worded statements? Libyans Ask! Abdulkader Assad: A freelance journalist and a writer. He is a lecturer of English literature and linguistics, holding an M.A in Applied Linguistics and a B.A in English Literature.